My current project Glowquest is a traditional dungeon crawler that uses Advanced Heroquest tiles. My goal is basically to have something more tactical than Advanced Heroquest itself (which hasn’t aged well in a lot of ways). Anyway I’ve been doing lots of solo playtesting to catch obvious shortcomings. But about two weeks ago I did a playtest with my target audience of 2 of my friends who I grew up playing Advanced Heroquest with. The game went pretty well, and it was good to get some real feedback from real people. My biggest concerns were around playtime and complexity. There were a lot of fiddly aspects to track, like should a monster Interrupt have triggered, etc. From the playtest I have a big list of TODOs. I wanted to cover some of the thinking I’ve had over the past while about solutions. First of all Surges didn’t quite stack up how I wanted. Generally you got too few. There’s a 62% chance you only get 1-2 Surges. I added Fate (which is a spendable resource that restores between expeditions) which can be used to get extra Surges as a band-aid for this. But what I think I’ll do instead is change the core dice resolution. Currently you roll 3D6, and the lowest result is the number of Surges, and the other two dice are added together to get your to-hit. If there is a tie/duplicate for lowest (such as 3, 3, 6) you add +1 Surges. So 3, 3, 6 would be 3+1=4 Surges and 3+6=9 to hit. 3, 3, 3 would be 5 Surges and 6 to hit. That seemed fine on paper, but like I said the math didn’t play out how I wanted during the playtest. Well wait, I should talk more about the game a bit first. 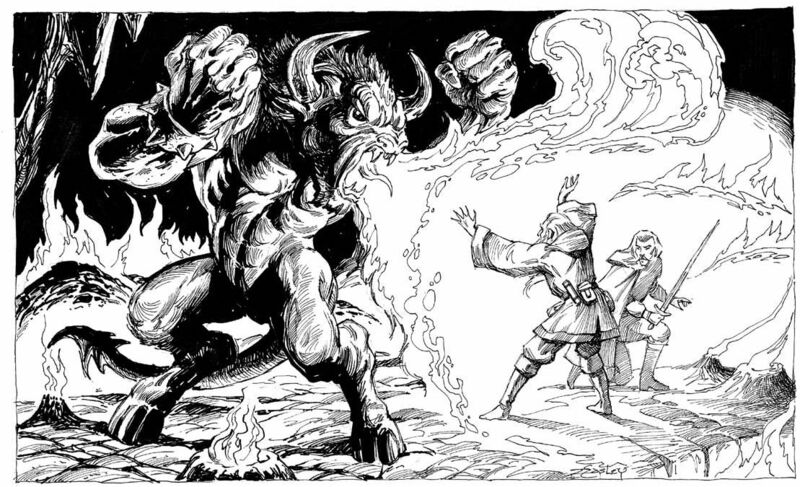 The idea is to strip away all the RPG elements that a lot of combat focused games have (D&D 4th edition was the worst offender, but really D&D in general is pretty light/unsupportive on non-combat actions). You choose a Race and Class and various equipment to make a “build” that interests you. 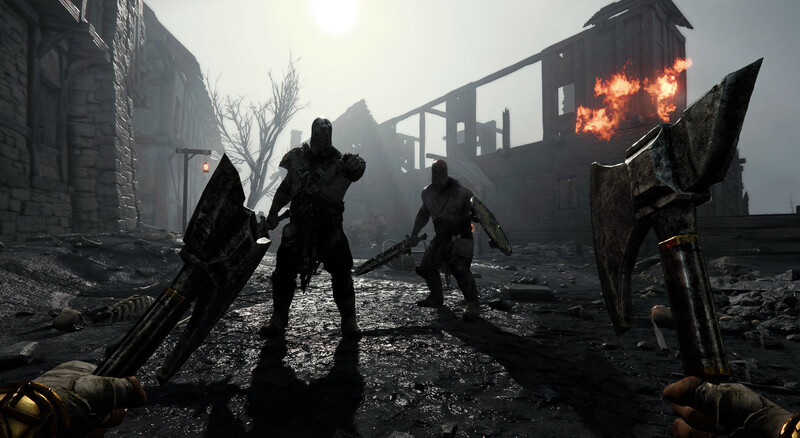 That might scare about people who like narrative games, but hey that’s what Fickle RPG is for, this dungeon crawler is about kicking doors and taking names, Icewind Dale CRPG style (or the hundreds of modern run-based roguelikes). I also wanted to use the Advanced Heroquest tiles…because they are beautiful and fun and bring back a flood of memories for me. Anyway this post isn’t about my childhood, it’s about the dice system. Roll 3D6. The two highest results become the to-hit roll and the lowest result is the number of Surges available. This means you will have between 1 and 8 Surges. If there is a tie for lowest result, add +1 Surge for each tie. For example rolling 5, 3, 3 would make a to-hit roll of 8 (5+3) and gives you 4 Surges (3+1). Another example would be rolling 5, 5, 5 which gives a to-hit roll of 10 (5+5) and 7 Surges (5+1+1). If the total to-hit roll is greater than or equal to the target’s Grit, the attack was successful, otherwise the attack missed. Some Activators can modify the to-hit roll to turn a miss into a success. Grit is basically Defense, except one of the class roles is called Defense. Not sold on the name, might do Agility, Resilience, Endurance, Evasion, or Dodge instead or something. I’m happy with this dice system concept. Before I was trying D12 or 2D12 (so you get 2 attacks all the time) to hit and D4 or D4+2 for Surges, but yeah, that might seem fine on paper but felt awful to roll. I hate D4s. I imagine using a D12 numbered 1-4 three times (like this) would feel better. But yeah, once I thought up the 3D6-use-lowest system I got super excited and really dove back into the dungeon crawler game idea, which has been rattling around my head for the past 3-4 months. As I was starting to hash out Activators that you can spend Surges on, I wanted to take a look at the odds of everything. So far I’m considering having Activators cost 1-5. But I needed to know how likely 5 was. What about how likely the max 8 Surges is? And so on. I also wanted to compare 3D6 drop lowest to a flat 2D6 in terms of the to-hit chances. I knew it’d be higher than the average of 2D6, but how much higher? What does this all mean? Well, many interesting things. Getting 5 Surges is equivalent to getting a “standard” D&D style critical hit of 20 on D20. So rare. Perhaps too rare. If I try the approach of lowest ties (such as rolling 5, 3, 3) adding +2 bonus Surges instead of +1, this improves from 5% to 7%, but also makes the maximum 10 Surges, which is quite a few (and also extremely rare – anything over 7 or 8 is). The game has an idea of “Fate Points” (again name likely to change) which are a limited resource each hero has that can basically be spent during an expedition as extra Surges. So tweaking those numbers might affect what dice system I use (whether ties are +1 or +2) and how I scale the Activators. But what I’ve done first is taken a step back and thought: what do I want the players to do each turn. How do I want the game to feel? Basically I want them to be able to fairly reliably hit, and do 2-3 cool things a turn. The +1 bonus Surge on ties seems a lot more intuitive: you have 1 tie, so you get 1 bonus, compared to +2. I also like the narrow 1-8 Surge range instead of 1-10. How it boils down is for +1 on ties you have a 62% chance to get 1-2 Surges, and 81% chance to get 1-3 Surges, so only 19% chance to get 4+, 8% chance to get 5+. When put that way, a 1/5 chance to get 4+ Surges, that doesn’t actually seem that bad, and 8% for 5+ is higher than a standard D&D crit of 1/20. And that’s okay! I like hitting a lot in games. There are many defensive layers and damage reduction/absorption that players can stack on. Damage itself is a flat value based on the weapon (and potentially boosted by Activators), so it’s fairly easy to calculate how soon you’ll die. All in all a useful exercise to model out. There’s been a real smattering of activity recently, plus I had a third kid, so you know how busy that makes life. Plus I tend to slow down on game design over summer since I’m spending much less time holed up by my computer typing stuff and more time enjoying the weather. A dungeon crawler with a focus on combat, exploration, looting, and improving and advancing your heroes. Heroes will leave the comfort of their town to undertake expeditions to randomized dungeons, which are represented with square grid tiles from Advanced Heroquest. The game is designed for 1-3 players who each play a role from the classic “holy trinity” of Tank (Defense), DPS (Offense), and Healer (Utility). 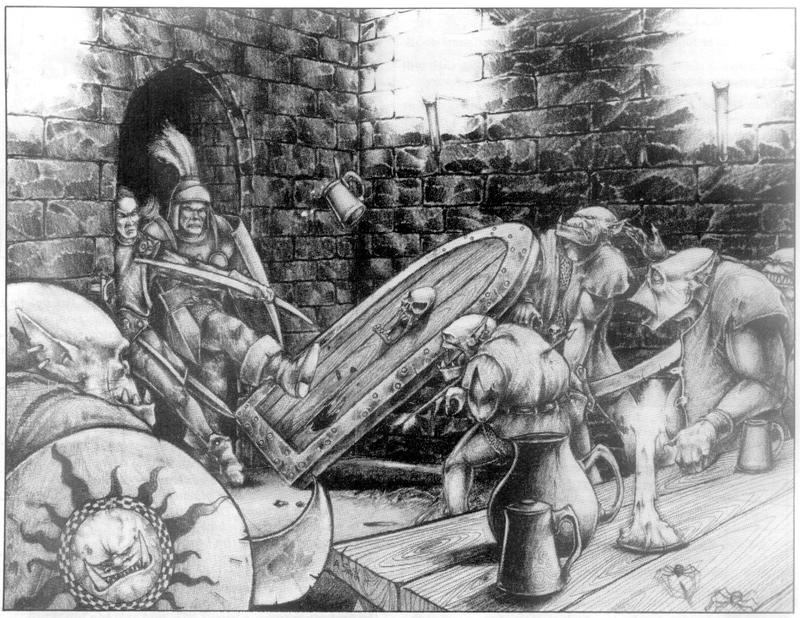 There is no requirement to have an extra player as a dungeon master who runs the game. So my nostalgic homage to Advanced Heroquest, with many modern mechanics pulled from all the best systems and ideas. This is currently my focus, and initial playtests are promising (and a bit easier than solo testing other RPGs since the party size is only 3, and the game is meant to be DM-less anyway). I have pages of brainstorm notes and ideas, and I’ve slowly been compiling them into a roughly formatted rulebook. I want to start filling out the Activators (basically special moves/attacks) list for classes/races/equipment soon so I can really sink my teeth into playtesting. I also want to try it with my oldest friends near the end of the month (who literally played Advanced Heroquest with me way back in school), so we’ll see how that goes! I’ve read White Dwarf since before I was a teenager. I remember seeing Blood Bowl way, way back then, and thinking “oh yuck a football game, I wouldn’t enjoy that at all”. I unfortunately have a bad habit of prejudging things before I try them. Well with the re-release of the ~4th edition official 2016 Blood Bowl game I finally sat down and tried it with my friend. I played Humans (him) vs Skaven (me), and thought, “hey, this game is basically just tactical movement with an objective!”. I enjoyed it and was pleasantly surprised. Then we brought out the turn timer, and the game went up a few notches for me just from that, because then you had pressure and had to think fast. We did 4 minute turns and I loved it. Soon after I bought a copy of the game for myself, including the Steam PC version (on a deep sale of course). I fell in love with Lizardmen. And since them I’ve played probably half a dozen more face-to-face games and double that on PC. I’m thinking of putting together a proxy Lizardmen team of underwater fishmen from Reaper Mini. Anyway that’s been lots of fun. Oh yeah and I’ve played like 300 hours of Vermintide 2 because man oh man, you wanna talk about a satisfying core gameplay loop? A while back I got an actual playtest against a friend with Echo Death. We normally play a monthly Android Netrunner but he was nice enough to try out my half finished game for a night. The game held up pretty well, and has a few areas that definitely need improvement, but was overall a good time. 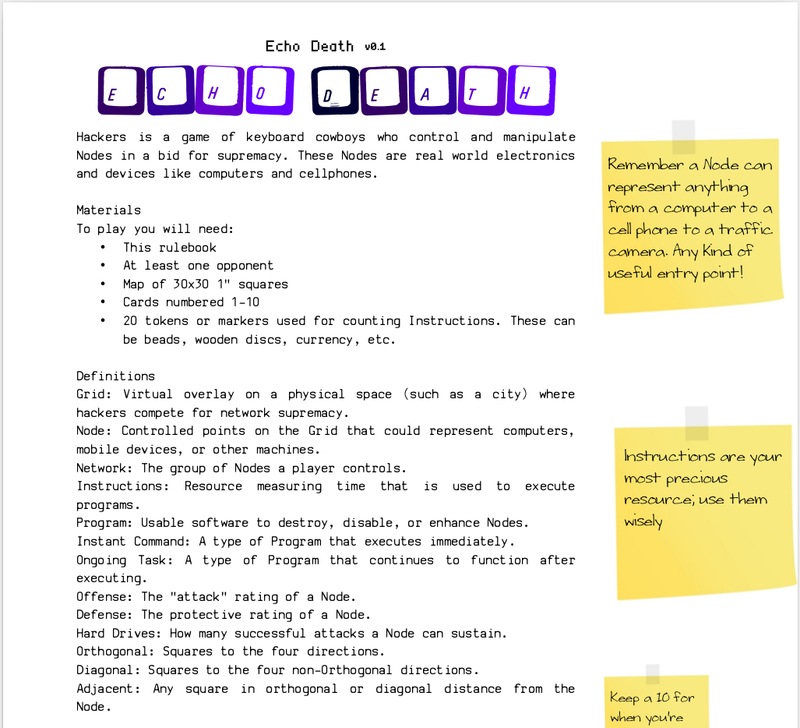 I compiled some Echo Death Playtest Notes that I need to revisit and apply to the rulebook. But for now that’s on the backburner. My next game to work on was White Line Fever. I played it a couple of times against my wife, and although it was okay it didn’t feel like driving a car recklessly. So I changed the main mechanic to be a “push-your-luck” style where you can try to get more actions (movement, turning, and shooting), but potentially can spin out of control (wherein the opponent moves you – normally face first into a wall). I also added the idea of record sheets instead of a paperless system. Tough to balance between customization and how lightweight I want the game to be. Either way this version was much more enjoyable. I’ve updated the rules with this “second edition” on the White Line Fever page. So yeah, a bit more polishing needed there, as well as fully printable record sheets (I just scribbled some notes on paper when I was playtesting). But again, that’s on the backburner too. Oh hey remember this game? I do! It’s been at the back of my mind even when feverishly working on and playing Fickle RPG. Echo Death has been kicking around for almost two years, and after my initial brainstorm and playtest I shelved it and meant to come back. I’m excited for the theme, and I’m excited to try a diceless system. I need to rewrite the entire rulebook from the ground up, but in the mean time I’ve been dabbling with different fonts, spacing, logos, and the idea of “sticky notes”. Realistically I want the rules to look like an old computer manual that a cool, hip hacker has written notes in and handed down to his buddy. Anyway, just something I wanted to share. I’m still going to wrap up Fickle RPG first before I move onto Echo Death, but besides maybe finalizing White Line Fever in the meantime I think this’ll be my next game. I have a monthly Android Netrunner game going at the moment so I think I could fit Echo Death in there for an easy playtest avenue. Bit of a departure from my recent Fickle RPG work, but the recent “alien campaign” will likely come to an end before April. So I wanted to change gears a bit, and decided to revisit my White Line Fever car game. I had put together brainstorm notes, then playtested a couple of times, then touched up my notes. You might remember the game is meant to be heavier than my Flickin’ Cars With Guns, but lighter than the classic Car Wars from Steve Jackson Games. Mainly with simplifying the turning template, and having some varying severity to shooting instead of an ablative armor system. I’m quite happy with how the rules look so far, from the subtle background picture to the car showdown. Just needs pictures throughout. Soon enough I’ll print them out and try to get a few games, just to polish up and finalize the mechanics. Then I might do an “Advanced” section with driver traits, different weapons, light campaign system, etc. I’ve always wanted to have a game where you could simulate a road trip (kind of given it’d be post apocalyptic) using real-world roadmaps. I’m absolutely in love with the title font. Some of the other formatting and effects were achieved with other cool fonts. Very handy website, and fun to find that perfect font. America is an irradiated wasteland. Within it lies a city. Outside the boundary walls, a desert. A cursed earth. Inside the walls, a cursed city, stretching from Boston to Washington D.C. An unbroken concrete landscape. 800 million people living in the ruin of the old world and the mega structures of the new one. Mega blocks. Mega highways. Mega City One. Convulsing. Choking. Breaking under its own weight. Citizens in fear of the street. The gun. The gang. Only one thing fighting for order in the chaos: the men and women of the Hall of Justice. Juries. Executioners. Judges. 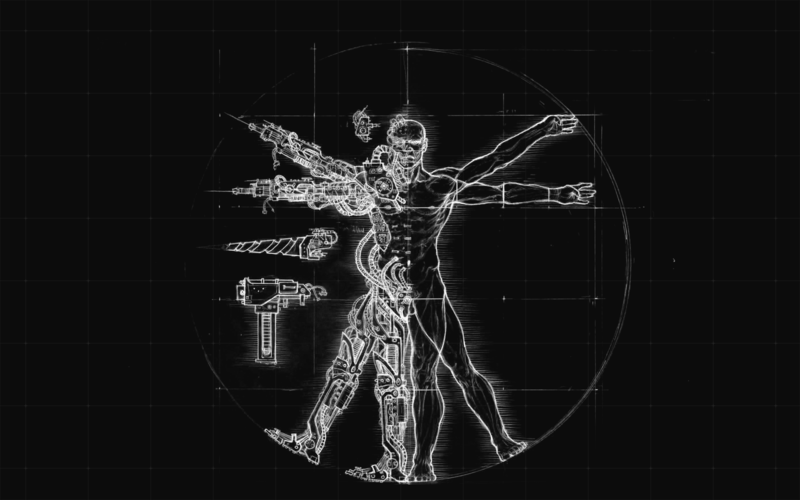 In addition to that element I really want to explore the trio of transhumanism paths: cyborgs, genetics, and cloning. I remember finding a rulebook about 3 or 4 years ago called Transhuman Space that dealt with some of those topics, and I found it fascinating. So maybe throw in a bit of Bladerunner and the recent Westworld TV show. Now I have a few options for this. I’d like to try Fickle RPG to see how truly flexible the rules are. So instead of my current/default theme of parasitic zombies, I’d go to a sci-fi theme. The other option of course is to make a completely new RPG game. Or maybe not even an RPG. Because what I think my focus and main interest would be asymmetrical rules, specifically having cyborgs, genetics, and clones play and function differently. All three are a path for human improvement, and have a lot of depth and brain bending concepts associated. I could see Clones as being cannon fodder, with a numbers advantage but less skill and personality. 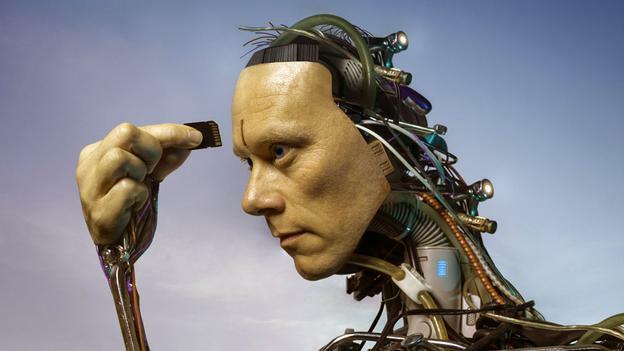 Cyborgs would be the opposite: powerful, expensive, and outnumbered. Genetics would likely fall in the middle, and be more about modifying existing humans. I have no idea how I’d make each type (faction?) feel different, or if a skirmish game, RPG, boardgame, or other rules approach would work best. I honestly just like the idea overall, and thought I’d write it down here to collect my thoughts.